Standard 6 speed with a Hemi motor, sunroof, navigation. It is fun to drive but if something tears up parts are expensive. One problem that I have had was my cooling fan broke and went straight through my radiator. I spoke with other Dodge owners and they say they have had the same problems. Per our local police chief it has happened several time on their vehicles. The classic American muscle car. 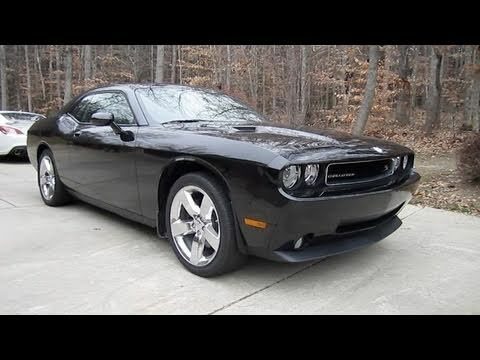 My car is a challenger srt8 the performance is great, no major issues. It is a classic muscle car that I purchased initially for nostalgic reasons. The car resembles the initial challenger from the 60s. Initially I had a minor brake problem that was quickly resolved by the dealership. Chrysler will notify owners instructing them to contact Kidde for a replacement fire extinguisher, free of charge. The recall is expected to begin February 9, 2018. Owners may contact Chrysler customer service at 1-800-853-1403 or Kidde customer service service toll-free at 1-855-262-3540, or online at www.kidde.com and click on "Product Safety Recall" for more information. Chrysler's number for this recall is T82. CHRYSLER IS RECALLING 6,636 MY 2008-2009 DODGE CHALLENGER VEHICLES EQUIPPED WITH AUTOMATIC TRANSMISSIONS AND "KEYLESS GO" OPTION FOR FAILING TO CONFORM TO THE REQUIREMENTS OF FEDERAL MOTOR VEHICLE SAFETY STANDARD NO. 114, "THEFT PREVENTION." IF THE STOP/START BUTTON IS PRESSED AND HELD AND THE ENGINE TURNS OFF, THE ELECTRONIC KEY CODE IS REMOVED FROM THE VEHICLE. SINCE THIS CAN OCCUR IN A TRANSMISSION OR GEAR SELECTOR POSITION OTHER THAN "PARK," AND THE TRANSMISSION OR GEAR SELECTOR DOES NOT BECOME LOCKED IN "PARK" AS A DIRECT RESULT OF KEY REMOVAL, IT WAS DETERMINED THAT A NONCOMPLIANCE MAY EXIST. THIS STANDARD SPECIFIES VEHICLE PERFORMANCE REQUIREMENTS INTENDED TO REDUCE THE INCIDENCE OF CRASHES RESULTING FROM THEFT AND ACCIDENTAL ROLLAWAY OF MOTOR VEHICLES. DEALERS WILL REPROGRAM THE WIRELESS IGNITION NODE MODULE SO THE ENGINE CAN ONLY BE TURNED OFF WHEN THE TRANSMISSION AND GEAR SELECTOR IS IN THE "PARK" POSITION. THE RECALL IS EXPECTED TO BEGIN ON OR BEFORE SEPTEMBER 15, 2008. OWNERS MAY CONTACT CHRYSLER AT 1-800-853-1403.